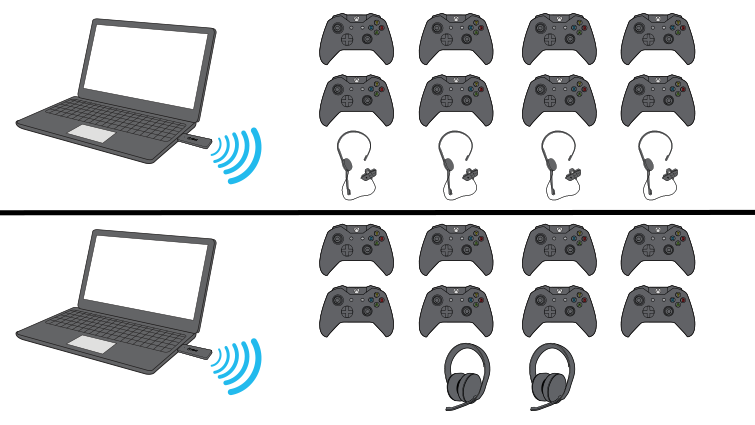 With the Xbox Wireless Adaptor for Windows, not only can you connect your Xbox One Wireless Controller to your Windows 10 device, you can also connect up to eight wireless controllers and up to four chat headsets or two stereo headsets without any cables between your controller and your Windows 10, 8.1 or 7 device. Note For information about using the adaptor with different versions of Windows, see Xbox One Wireless Controller differences on Windows operating systems. Would you like to contact Support regarding the "Xbox Wireless Adapter for Windows features" issue you were reading about or a different issue?